Topsail Reef is a 240-unit oceanfront condominium complex located in beautiful North Topsail Beach, North Carolina. Every unit at Topsail Reef offers views of the ocean. We are situated forty-five miles east of Wilmington and twenty-seven miles south of Jacksonville. Our facility has a multipurpose court where you can play tennis, volleyball, basketball and pickleball. There are also two laundry rooms onsite and two grilling areas complete with pergolas and restrooms. 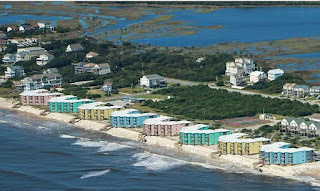 The complex offers private parking and all 8 buildings provide beach access to homeowners and guests. North Topsail Beach offers amazing views of the Atlantic Ocean and is a quiet family-oriented beach. The beaches are never crowded even in the middle of the summer season. Across the street from the complex, there is a convenience store and outside Tiki Bar. Seaview Fishing Pier is located 3.1 miles away and has a fishing pier, tackle shop and restaurant that serves breakfast, lunch and dinner. North Topsail Beach Town Park is just 4.1 miles up the road and provides playground equipment for the kids, walking trails, access to the ICW, tennis and basketball courts that are open to the public. It’s just a short drive away to Surf City where you will find quaint little beach shops and a selection of family owned restaurants, many of which provide locally caught seafood. Topsail Reef is one of those hidden gems with a laid-back island atmosphere. You really must visit to get the full experience and to enjoy the sea breezes and panoramic ocean views from every direction as well as the welcoming small-town hospitality. 1 Bedroom - 1 Bathroom: 532 Sq. ft.
2 Bedroom - 2 Bathroom: 840 Sq. ft.